Lawson, Deodat (fl. 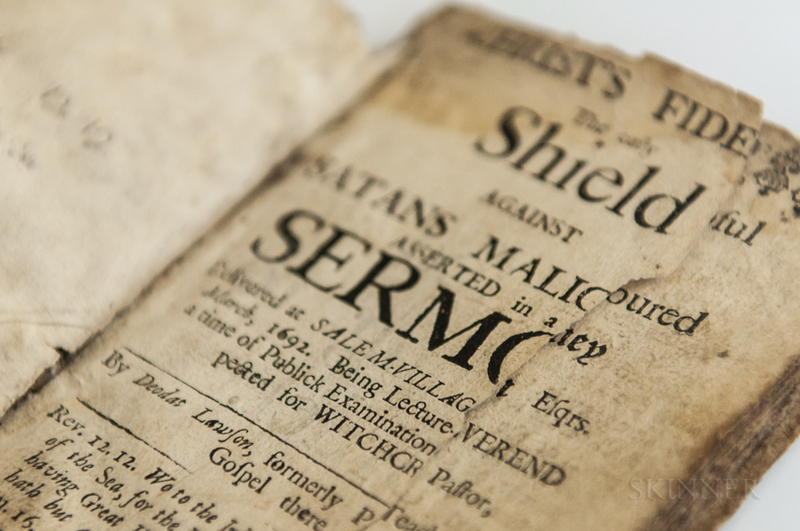 circa 1690) Christ's Fidelity the Only Shield against Satan's Malice Asserted in a Sermon Delivered at Salem-Village. Boston: Printed by B. Harris, & Sold by Nicholas Buttolph, next to Guttridg's Coffee-House, 1693. First edition, 12mo, a note of approval on the text underwritten by Increase Mather, Charles Morton, James Allen, Samuel Willard, John Bailey, and Cotton Mather is printed in the preliminaries, this copy is bound in an unsophisticated contemporary thin wood board binding covered in sheepskin (damaged, large chunks of boards and covering material missing from the heads of both boards), title page torn in half vertically with loss, A4, B8, C-I4, K3 (lacking final leaf K4); rare, seven copies listed in ESTC (U.S. libraries only), no copies offered at auction since 1918, 5 1/2 x 3 1/2 in. Lawson was minister of Salem Village from 1684 to 1688. When the witchcraft scare broke out in Salem in 1692, he returned to observe and report. Fearful of demonic possession, Lawson believed that he had lost family members to the devil. In his sermon, he tries to offer Christian support. "Be vigilant, be careful to avoid all sin which might betray you, Because your Adversary the Devil goes about as a Roaring Lion, seeking whom he may Devour. [...] So far as we can look into those Hellish Mysteries, and guess at the administration of that Kingdom of Darkness, we may learn that Witches make Witches, by perswading one the other to Subscribe to a book, [...] and the Devil, having them in this subjection, by their Consent, he will use their Bodies and Minds, Shapes and Representations, to Affright and Afflict others at his pleasure for the Propagation of his Infernal Kingdom."